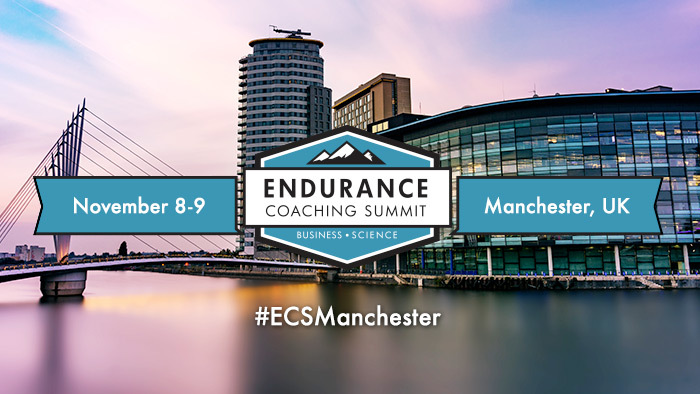 TrainingPeaks Brings the Endurance Coaching Summit to the U.K.
We are excited to announce that the TrainingPeaks 2018 Endurance Coaching Summit (ECS) will be held in Manchester, U.K. November 8 – 9, 2018. Located in one of the top sporting cities in the world, ECS Manchester will give attendees access to state-of-the-art conference, training and testing facilities in partnership with Etihad Stadium and the Manchester Institute of Health and Performance. This year’s keynote speaker, Chrissie Wellington, is an Officer of the Order of the British Empire and a four-time IRONMAN world champion. Since her retirement from professional racing in 2012, Wellington has authored two best-selling books and focused heavily on philanthropic efforts for charities including the Challenged Athletes Foundation and the Blazeman Foundation for ALS. She is currently the Global Lead for Health & Wellbeing for Parkrun, and lives in London with her husband and daughter. TrainingPeaks has partnered with British Triathlon and British Cycling to ensure the continued delivery of world class education for coaches, and all of their certified coaches will receive $120 off Summit pricing. Additionally, for all American coaches, USA Cycling and USA Triathlon will continue to be endorsing partners, providing continuing education credits for both the in-person and online Summit. More than 600 coaches from 15 countries have attended previous ECS events. The 2018 Summit will build off the same successful format, including keynote presentations mixed with valuable, smaller breakout sessions with thought leaders from the endurance sports industry. ECS will cover the key business challenges faced by today’s coaches to give them the tools needed to grow their brands, increase their clientele and fine-tune their coaching practices. Attendees will also gain practical insights into the latest research and science-based strategies. Previous speakers include Joe Friel, Dave Scott, Dr. Iñigo San Milan, Neal Henderson, Siri Lindley, Dr. Allen Lim and Bobby McGee, among others. A full announcement of the Summit agenda and speaker lineup is expected soon. For more details and to register for Early Bird Registration rates, visit EnduranceCoachingSummit.com.